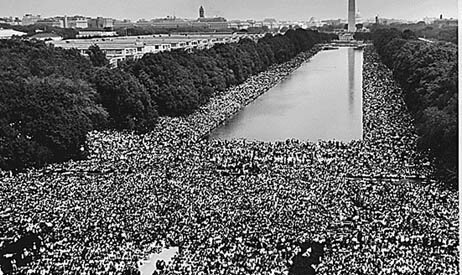 Fifty years ago today men, women and children of all colors and backgrounds marched on Washington to say enough is enough. The malignant conspiracies of discrimination among the most powerful against the poor and people of color had for far too long prevented our nation from realizing its greatest potential. They spoke truth to power. They had the courage to push back. And history was on their side. We create our governments, and empower its agents, with the duty to ensure the absolute protection of the civil liberties with which each one of us is born: regardless of our ancestry or how much melanin we have in our skin. It is the principle on which America was founded: individual human liberties are a birthright, and the purpose of a government is to ensure that inheritance. Every generation since 1776 has been tasked with the responsibility to build on that foundation, to do what we can and what we must, to leave freedom stronger for those who come after us. Every generation must push back against the perennial forces of tyranny that literally profit from the suppression of liberty. It is the ongoing revolution in which free people must be engaged, in every land and in every age hence— or choose to knowingly abandon our just inheritance. That knowledge is the most palpable legacy of the March on Washington: that we each share in the responsibility to move our nation closer to its ideals; and in so doing, the world. Tyranny has taken many forms, but always with the aim to imprison our minds, to control our bodies, to weaken our faith in humankind, in our neighbors, and in ourselves. But for those who stand against injustice and tyranny, we are there. That is precisely what makes us Americans; and that is why our best days are yet to come, for history will always be on the side of those who take that stand and who push back. The struggle of any human being to realize his or her birthright, to stand up against the forces that would see them stripped of their freedom and humanity — their struggle is our struggle. Their march then, is our march now. We as a people are standing on the steps of the Lincoln Memorial. We listen to Dr. King in the Washington summer of ’63, just as we can hear the bell ringing through the summer streets of Philadelphia in ’76. We are crossing the North Bridge in Concord. We are crossing the Edmund Pettus Bridge in Selma. We are there. We are here. The revolution is always at hand. — Coy Barefoot, Charlottesville, VA. August 28, 2013.